Elizabeth definitely. I think it'd be a fun challenge to play her too. Any thoughts on who can be her Darcy? I totally forgot about the physical appearance. I was thinking about the comedy and how fun it'd be to see her play someone shady. Yeah, we don't get to see Emilie do comedy that often, but since she's so witty in real life, i think she'd have no problems. I think he would be very good with Emilie, and David has previously played Darcy in a stage version of the story so i know he can play him well. Ah, David Oaks. I keep seeing gifs of him on tumblr because he's playing Prince Albert's brother in Victoria. I actually didn't think about either of them Matthew Macfaden was the perfect Darcy for me. I like the tall, broad shoulder thing he's got going on. I think Emilie would be pretty badass as a villain, especially because she's got that sweet, innocent look. Hierophant will forever be my favorite role of hers. What about an action role? Like a Sydney Bristow type role. Or a superhero? especially because she's got that sweet, innocent look. She draws you in and then bites your head off. I can see her as a Supergirl type of superhero. I was thinking Emilie would be great as Black Widow, although I'm not sure if she's really a superhero, she's seems more ambiguous as a character, like Cat woman. Oh Lilmouse I've been watching Victoria, it's so good and quite funny in places actually! Ah Matthew MacFadyen was a good Darcy, i've been watching him in Ripper Street, he's such a great actor. My Fav will always be Colin Firth though . I feel so weird shipping Albert and Victoria. I've heard the actors have a lot of chemistry. And the gifs I saw of his love for trains are funny. Emilie would rock the Cat Woman costume, for sure. She can study Stanley, copy his moves. My mom wanted to give Ripper Street a try for Matthew, but I don't think the show is up her alley. It looks too violent. I never saw Colin's version. Enjoyed watching both men play the role. Yesterday, news broke that Terry Moore's award-winning indie comics series Strangers in Paradise is set to become a feature film from director Angela Robinson, director of Professor Marston and the Wonder Women. Since it's a comic book movie, you know what happens next: we have to speculate about who might be a good fit to cast the main characters (and a few select supporting cast members). The long-running comic, which will return for a short engagement in 2018 to celebrate its 25th anniversary, centers on three characters: Katchoo, Francine, and David. The three are living a quiet life in Texas when dark forces from Katchoo's past track her down, hoping to take everything from her, including Francine and David. So, let's take a look...! Katchoo is an interesting character to cast, because there are so many actresses that look the part, and a great deal of whom could carry the role -- thinking about somebody who has the capacity to do the lost, angry thing that Katchoo does, and who can do all of that while still believably looking like someone that can be consistently underestimated...well, that's a slightly taller order. 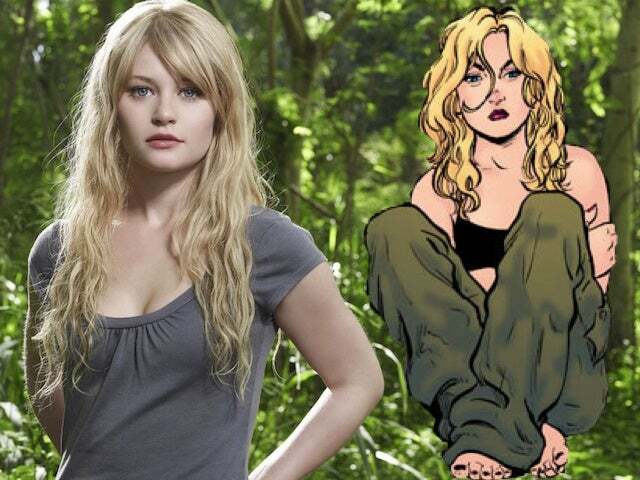 Lost alum Emilie de Ravin might be a good candidate. She is a compelling actor who would turn heads the way Katchoo does, but who is very good at playing quiet and stoic when necessary. We also know that, for the physical stuff that is inherent to some of Katchoo's stories, de Ravin has a history in horror and genre material that means she has learned how to convincingly put a little bit of violence on screen. She does sound like a good fit for the part! That cartoon image is Emilie's twin. She should take on the role. I agree!! The cartoon does look just like her! It's like the creator was picturing her in the role all along. Some other roles in mind?